The Botanical Research Institute of Texas held a ceremonial kickoff for the George C. and Sue W. Sumner Molecular and Structural Laboratory last week. Rendering courtesy of BRIT. The Botanical Research Institute of Texas, known for its world-class plant collection, will soon be able to dive deep into a plant's DNA. BRIT board members and donors gathered Thursday for a ceremonial reveal of what will become the George C. and Sue W. Sumner Molecular and Structural Laboratory under construction in Fort Worth. “The need for the lab and its creation stems from an overlooked truth - all of our lives depend on plants,” said Ed Schneider, BRIT’s executive director. BRIT already houses the largest herbarium in Texas. The new state-of-the-art lab will allow researchers to add another dimension to their plant bank as they continue to catalog them. 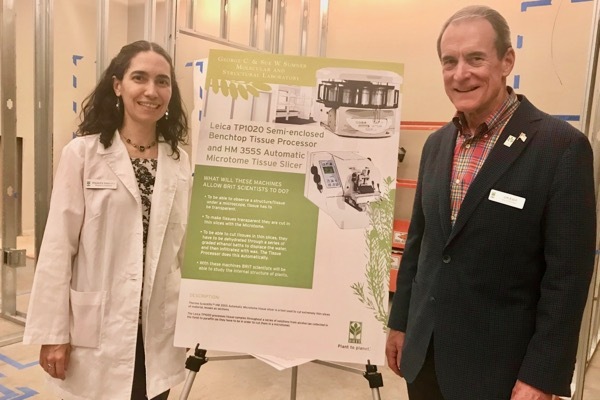 BRIT botanist Alejandra Vasco, shown with BRIT board member James C. Estill​, briefed visitors on the lab's capabilities on Thursday. Courtesy of BRIT. While scientists have long examined the outer structure of plants for clues to their relationships, today scientists use DNA as an additional tool to understand how and whether plants are related. This is especially important when dealing with endangered plants. “We can study a plant species from Fort Worth and that same plant species in Dallas and compare their DNA to see if they’re the same, if they share genes, or if they are different,” said Alejandra Vasco, BRIT botanist. "This can help determine its rarity." Vasco said UTA, TCU and Tarleton State University faculty and students will be able to use the lab for in-depth conservation research. Prospective university-related projects include creating a DNA and genome bank of Texas plant species for conservation, assessing the genetic diversity of rare and endangered Texas plant populations to prevent their extinction, comparing genome diversity in crop plants and their wild relatives for plant breeding, sampling the genomes of plant communities to understand ecosystem functions and discovering gene function for plant development, disease-resistance, and adaptation. BRIT will also be partnering with Texas Parks and Wildlife Department to identify and protect rare and endangered native Texas plants. The lab facility, expected to be completed in the fall, is located on the first floor across from the herbarium. Large windows will give visitors the ability to observe work being conducted by researchers and students. “This new multi-purpose molecular and structural laboratory adds unique dimension and depth to BRIT’s research and education programs in plant systematics, or the biological classification of plants,” says Schneider.